I would like to share with you the wonderful experience I had at the largest Christmas Fair in all of Scandinavia. I would like to describe for you the ideal Dickens holiday setting. How this 1800s manor has been perfectly preserved, with the mill houses situated on the rushing rivers powering the water wheels, how the barns and stables and smithies have all been converted into local artisan boutiques, and how all of the building and the trees lining the pathways have been decked out with bows of holly and white Christmas lights line the walkways. Herb crusted sausage…none of which I had a chance to sample. I would like to share with you the aromas that filled the chilled air, how the smell of wood burning in the braziers mingled with the sweet smell of roasted almonds and handmade peppermint candies. I would like for you to close your eyes and breath in the fresh smell of pine and open your eyes when you exhale to see the mist from your warm breath float away. I would like for you to hear the chatter of hundreds of people moving in and out of the stalls lining the property, of vendors chatting up their next customers, or the choir singing carols to the rapt audience, and of the children squealing with delight at the sight of Tomtem (Santa Claus) as he sat on his chair and passed out ginger cookies to all of the kids brave enough to sit on his lap. 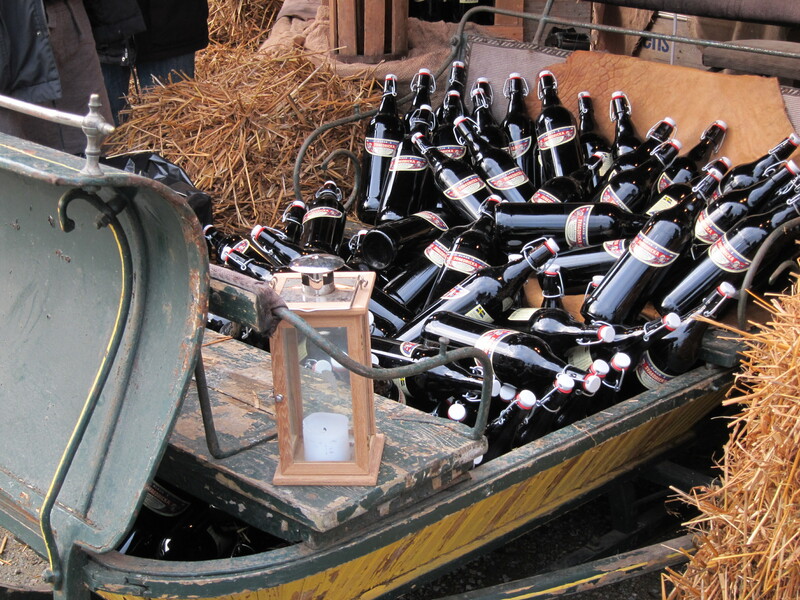 A Sleigh full of Beer…which I did get to sample, not too bad. I want you to see the sleighs full of eighteenth-century beer and all of the glogg (mulled wine) stands, and for you to taste the diverse array of cheeses and sausages out to sample. I want you to enter a food tent and be assaulted by the contrasting warmth and the smell of roasted meats and freshly brewed coffee. I want you to walk through the crowded stables lined with handcrafted wool hats, scarves, and gloves, of the handmade wooden toys and art pieces being sold in good Christmas cheer. I want you to look closely at the glimmering silver jewelry and carefully select the perfect bracelet for your wife, or that superbly crafted leather belt for your husband. 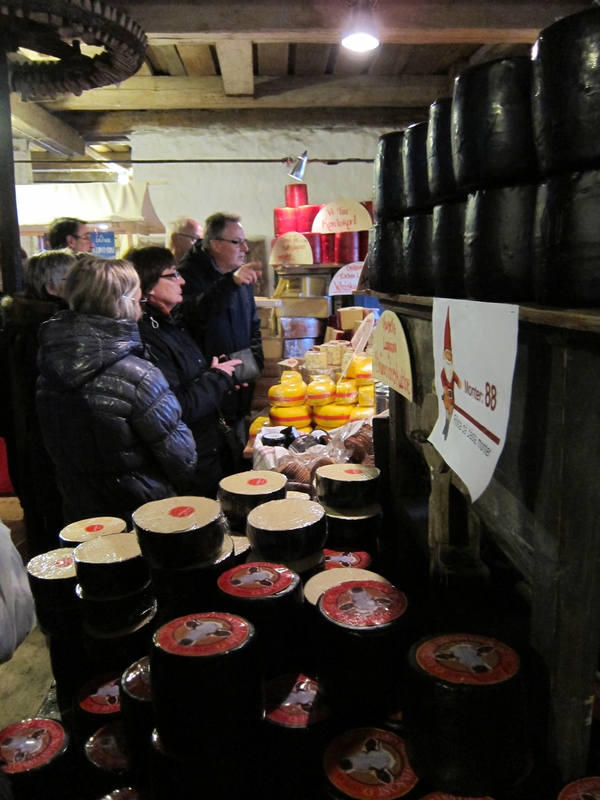 Wheels of Holiday Cheese…none of which I had a chance to sample. All of this I would like to share with you; but I can’t. You see, I went to the largest Christmas Fair in all of Scandinavia with a thee-year old child named K. And while I love K with all my heart, he is not the child you want with you to enjoy a cold, crowded, and bathroom-scarce festival. K doesn’t like crowds. K also doesn’t like walking. So, here we are a happy family of four walking into the largest Christmas Fair in all of Scandinavia (have I mentioned that before?) with my lovely wife pushing K in his stroller, which he outgrew at least 8 months ago but refuses to go out without, M strapped to my back. 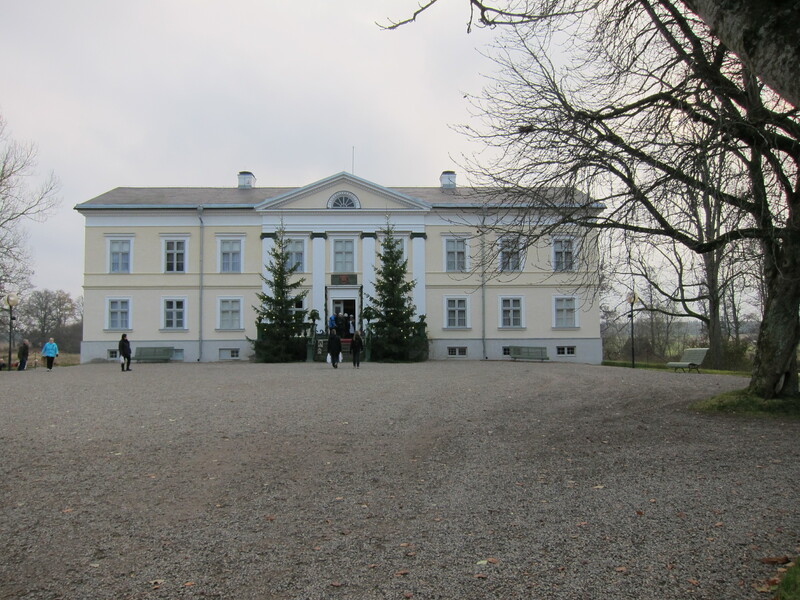 The manor at Husby has been perfectly preserved and those walking paths were not intended for such large numbers of people, or strollers. 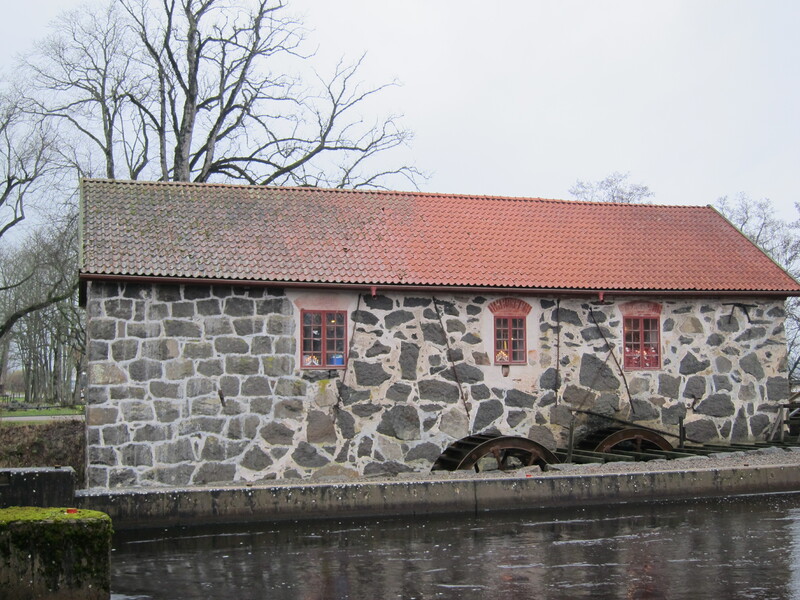 Entering onto the property, we crossed a small bridge with a creek rushing beneath and on the right was an old mill house, with a still operational water wheel, which now housed vendors of coffee, tea, cheese, crackers, bread, cookies, and glogg. We left the stroller outside and got K inside, but the press of the people was too much. With M on my back, I could barely move and ended up knocking, a bit too roughly, into some of the holiday shoppers. After finally emerging, without being able to sample nearly as many of the goods as desired, we made our way further onto the property and found Santa Claus, situated strategically next to a glogg stand. (And the spiced apple and raspberry wine was delicious, unfortunately it was the only sample I was able to taste on this visit.) Following our photos with Santa we made it to the next converted barn. 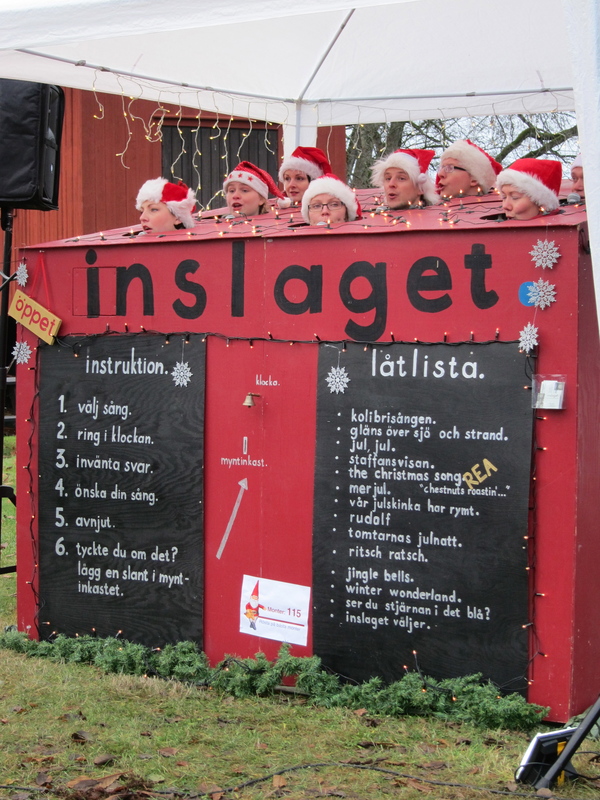 Inside were artisans selling hand-blown glass, handcrafted Nordic Santas and gnomes, as well as a variety of jewelry. This is where K had too much and enough was enough. Like a good three-year old boy, he wanted to touch everything and play with them, but a hand blown glass Christmas tree was not exactly a toy we want him to play with; so after continually telling him not to touch, he breaks down and throws a mini tantrum. We acknowledge his feelings and decide that it is probably not a good idea to bring K into these dark, crowded, and over-stimulating venues. The 1st Mill House we visited. Okay, one goes in while the other stays outside with K. I am sorry. I married my wife so that I could spend as much time with her as I possibly could. And I simply don’t get any enjoyment of looking at the crafts, which sadly were really not that impressive, without being able to share it with her. So now I am in a funk and bitter about being separated from her. After going into one building with only M, during which time she is outside in the cold trying to entertain K, we decide to stick together and only look at the stalls lined up outside along the walkways. 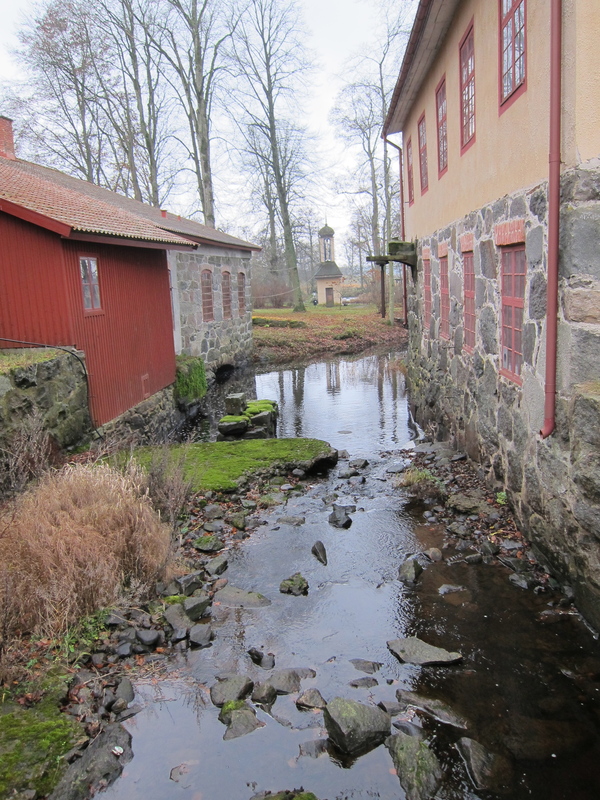 Creek between two historic buildings. This approach worked a bit better, but anytime we slowed down to look at something K would bellow for us to “Keep Moving!” “Don’t Stop!” so we hustled through the property flying by the sausage vendor, the beer vendor, and woodcrafters, and even the holiday candy stand. We finally reach the far end of this very beautiful manor and attempt to venture into another converted barn. Perhaps we chose unwisely, perhaps we should have insisted on K using a bathroom before entering this very long and narrow, and filled beyond capacity with shoppers barn before entering. But we didn’t. We parked the stroller, and slowly followed the shuffle of the crowd into the long abyss of holiday cheer. Nearly halfway through the abyss of holiday cheer, he happened upon the toy maker. A very cute husband and wife team plying their wares of handcrafted wooden toys, specializing in cars, trucks, and trains. And stupidly, we asked K to pick out a birthday present for his brother M, who will be turning a year in just over a month. Bad idea. Very bad idea. An even worse idea was actually buying a toy for M and not K from the cheery old crafty couple (who were all too eager to keep suggesting things for K as well.) BREAKDOWN!!! Christmas Lights adorn the manor. I will skip the details, but many of you might know the feeling of having a full tilt tantrum in the middle of a bustling shopping center…and if you don’t, then count yourself lucky. After my amazing wife, with infinite patience, settled K down a bit, he uttered the next phrase, “Pee is coming.” which is universally dreaded by all potty-training parents stuck dead center of an annoying long and crowded barn full of strangers. Well, we rush to the far end of the barn, hoping for a clear path to the exit, we make good time, emerge back into the cold air and desperately look for a bathroom…nothing. On the hill, back before this annoying long barn we had just passed through, we saw a public restroom. My wife scoops up K and rushes for it; she gets there without the pee actually coming, but the line for the lady’s room is long. No line for the men’s room, but some sever dirty looks when she tries to enter. (I was left behind with M to recover the stroller and meet them outside the restroom.) She puts K down and tells him to go inside and use the toilet. He walks in five steps, stops, turns around and walks out. He is not going to pee by himself in a strange public bathroom. They finally get into the lady’s room, with K showing uncharacteristic control as he still has not let the pee come, they get into a stall, everything is set for success…until, “Its smelly. I can’t pee here.” WTF and many more colorful words race through my wife’s mind, but she holds fast, demands that he goes and starts to count. Amazingly, K goes and there is no accident, but by then we are all pretty burned out of this experience and decide it is time to head home. On the way out, we got caught by the carolers. K demands that we stay and listen to them and listen to them and listen some more. And luckily, they weren’t half bad, even if it was all a capella. (Being in Swedish also added a nice ring to it.) 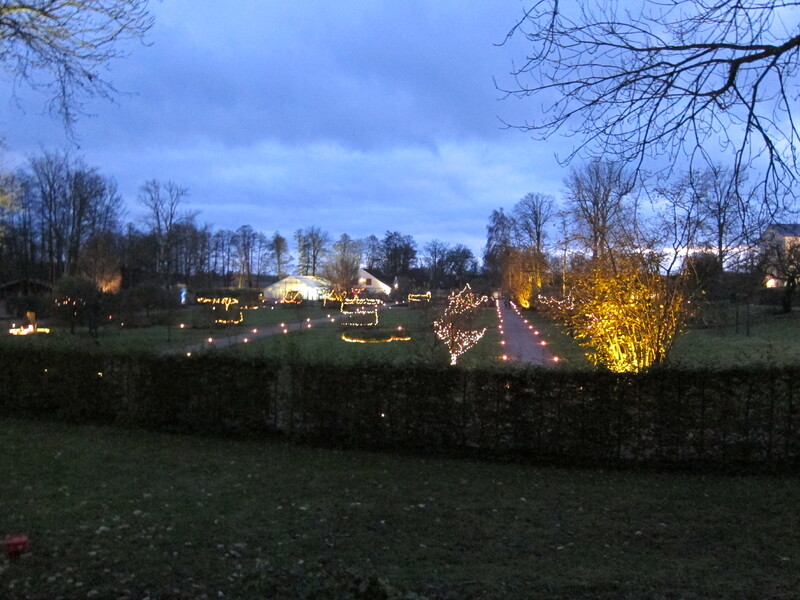 But finally, we got back in the car and left the largest Christmas Fair in all of Scandinavia behind. But, will this be our last foray into the abyss of holiday cheer? Oh no. 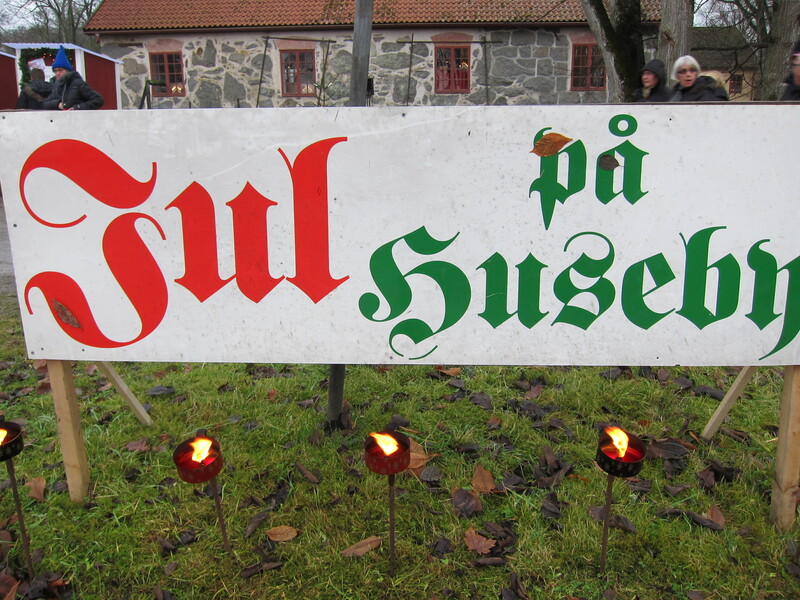 On December 1stthere will be another Christmas Fair at Kalmar Castle, a real authentic European castle!!! (I’ve yet to see one so I am very excited.) And like any good parent, my wife and I will simply forget about the bad experience we had at this fair and joyfully immerse ourselves, and our two boys, into another wonderful family holiday experience. 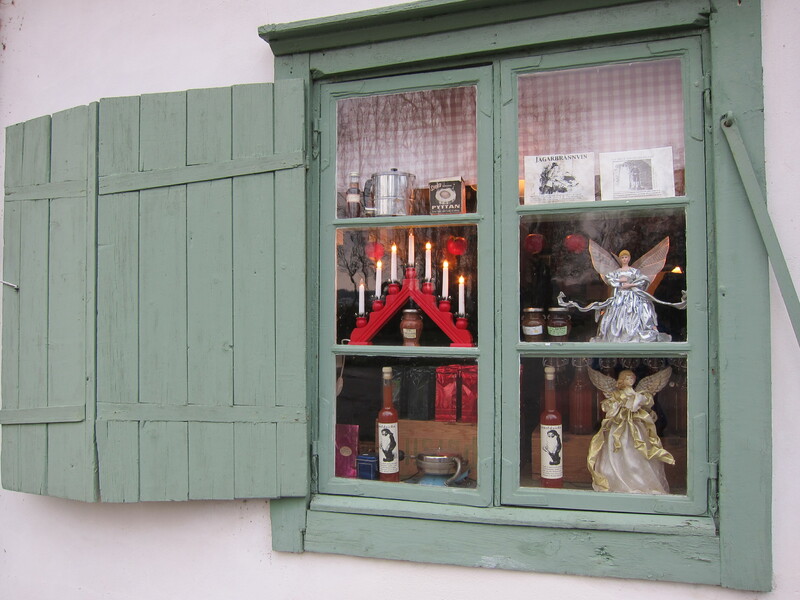 Window of a shop decorated in typical Swedish holiday style. Enjoyed your story immensely and can relate to it so well being the mother of 3 boys.! Thanks so much for sharing. Thank you for reading. I am sure most parents out there can relate, but it is good to hear those stories from time to time and I am sure with three boys you have a bunch of stories waiting to be heard. GREAT as usual….gets one in the Christmas spirit! Maybe not so much the KIDS and Christmas spirit…. Yeah, it might take a bit more for the kids to get in the spirit…but K has been talking about Santa ever since he got a gingerbread cookie, so not a total lost. Your stories are such a joy to read, and I always get a few good laughs from them. Your family is typical so do not despair. Jim would last only a few minutes in a place like that and he’s 70! I love the part about the pee is starting! I’ve used that myself! Keep posting David! Have a wonderful holiday season! Thanks for reading!! I think Jim would very shortly position himself at one of the glogg stands, get a bit sloppy, and attempt to cat-call you in Swedish, pretty fun picture. Great stuff, sir. The market sounds marvelous, but yes, kids have a way of making things a bit more…difficult. 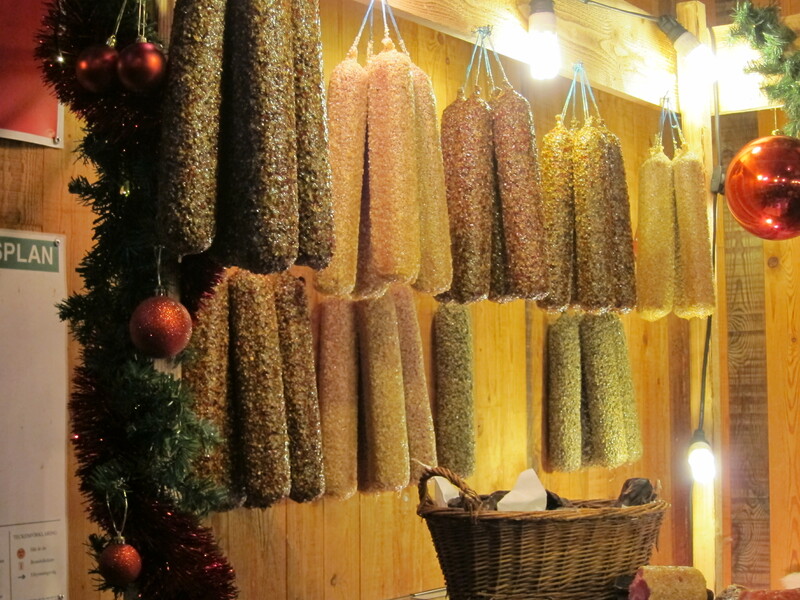 We have a fantastic Christmas market here in Budapest, and your detailed description of the sensory experience was very much like walking amongst the stalls here. Keep it up, meboy! Thanks for reading. It sounds like next year we might need to make it out to Hungary for some new markets. We just went to another market that was hosted in a castle, much better results with the kids. I’ll be posting about it today.